When Should Athletes Eat Honey? Honey is a sweet and thick fluid honeybees produce from flower nectar. Your body easily absorbs honey. Honey is made up of approximately 70 to 80 percent sugar. The rest is made up of water, minerals and traces of protein, acids and other substances. 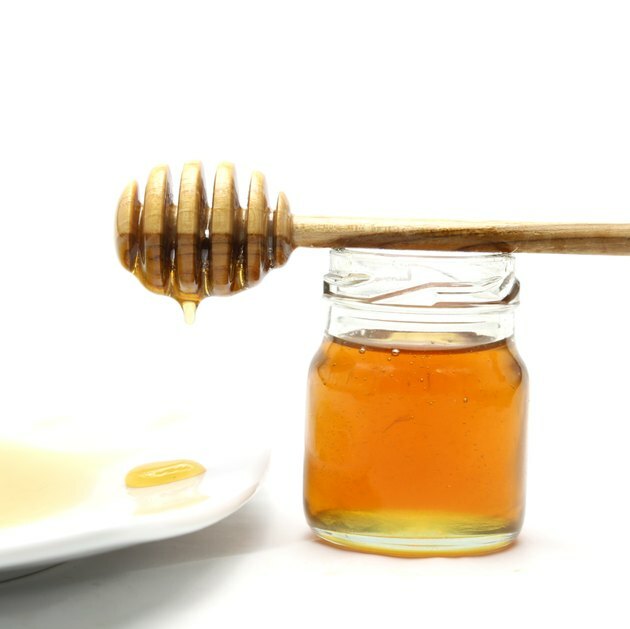 Honey is used as a natural sweetener and has been a medicinal aid since the time of the ancient Egyptians. Honey also is used to enhance sports performance. Honey is a high-carbohydrate food. One tablespoon contains 60 calories and 17 g of carbohydrates, of which 16 g come from sugars. Honey contains no fat or protein and trace amounts of vitamins and minerals. Consuming carbohydrates before and during exercise can help improve your performance. Before exercising, these carbohydrates should be in the form of a snack, while during exercise it should be a sports drink. Following exercise, protein and carbohydrates should be consumed within two hours. Not all carbohydrates successfully serve this purpose. This is because different types have varying affects on the delivery of carbohydrates to your muscles and elicit different hormonal responses, according to the February 2002 issue of "Strength and Conditioning Journal." Many athletes opt for sports gels to satisfy their carbohydrate needs prior to and during exercise. However, honey may be just as effective. When compared to placebos, sports gels and honey helped athletes to generally perform faster in time trials. In addition, athletes consuming sports gels or honey are able to generate more power in the last stretch of exertion, according to a double-blind randomized controlled trial in the March 2004 issue of "Journal of Strength and Conditioning Research." Taking honey prior to vigorous activity, such as cycling, can benefit performance, and it may be more economical than sports gels. Cyclists who consume 15 g of honey prior to a race, and every 10 miles, perform better in time trials than cyclists who consume regular sports gels. In addition, both of these groups have increased power and higher resting heart rates then cyclists taking placebos, according to a study in the February 2002 issue of "Strength and Conditioning Journal." What Are the Benefits of Eating Honey After Exercise?